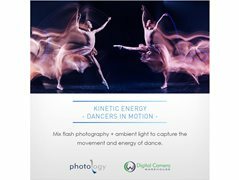 We are looking for dancers to perform live for a group of photographers for a photographic workshop. The session is 3 hours long in total but we will split that up with breaks and short burst of dancing and motion. If you have a partner or people that you dance with please let me know. This session is paid and we will provide some images for your portfolio. We are happy to work with various types of dancers so long as there is some good motion. This shoot would suit contemporary styles of dance more than say ballroom but we are open to ideas.